Leverage Sailthru’s customer profile to activate interactions and customer data insights that power experiences across channels and devices in real-time — enabling you gain a complete view of each individual customer in one central place. Taking data from multiple sources including information about demographics, behaviors, interests, purchases, engagement level, predicted actions, devices, custom data sets unique to your business and more, building a complete comprehensive customer profile on each individual happens automatically with a few lines of code. individual. With the ability to view each and every customer profile individually, marketers gain insight on the historical lifecycle of each customer. Instantly activate and use the customer profile in the Sailthru platform to inform marketing campaigns with data from multiple touchpoints on single or multiple channels, on the minute and in real-time. Sailthru makes data science and machine learning easy for marketers to use to deliver the most relevant customer experiences. Always be one step ahead of your customers with 13 out-of-the-box predictions to determine when, where, and how your customers will engage with your brand and then act on that data to advance segmentation, optimize new customer acquisition, decrease customer churn and increase email response rates of your individual customers. Easily access the intelligence you need, when you need it. 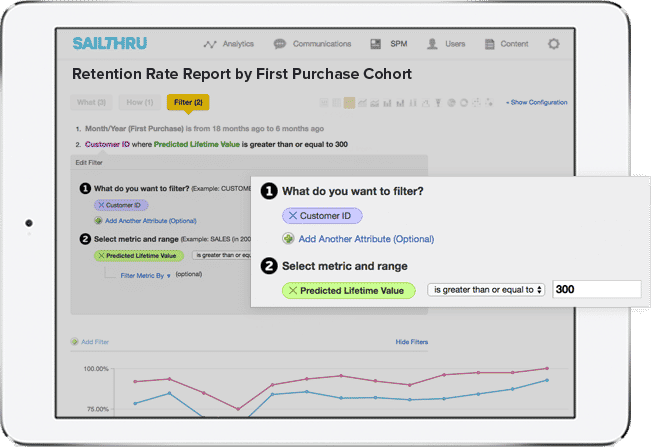 With simple analytics tools that allow marketers to view real-time updates, campaign data, and customizable reporting to a multi-dimensional data cube for an in depth analysis of customer cohorts, Sailthru empowers marketers to identify and optimize against the key drivers of success within their marketing strategies.